When I hear that Arjen Lucassen is up to something new, especially from his always provactive Ayreon project, I take notice. Then to hear that his successful and engaging album The Human Equation has been given a live theater experience, well, that's pretty fandamntastic. But here's the thing: technically, even though Ayreon on the cover, this isn't a Lucassen project. At least, no so much. He was more an interested, semi-supervising, bystander, as he watched the process and production of the show come together. (Lucassen doesn't have any interest in playing live because, one, he doesn't enjoy it and, two, he thinks any Ayreon music is to complex to be played live (let alone get all the players together). More on that in a moment.) 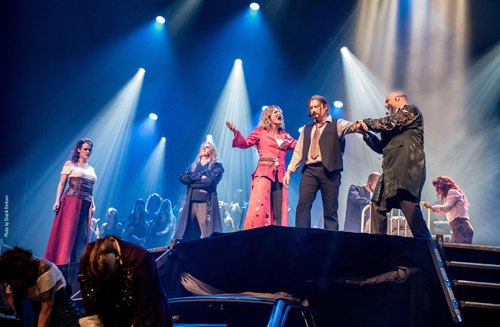 The mastermind here was Joost van den Broek (Star One, Ayreon, After Forever) as the musical director who gathered most of the orignal players (sans Arjen), the band, and an epic choir. Joost also re-arranged the Ayreon's compositions to simplify them, dumb them down as it were, for the theatrical context which, later, Lucassen's praised. But moving on to the DVD, I have to be honest at the start. I didn't actually watch the DVD. Nope. I had access to a streaming video of The Theater Equation. This means I had to view the show on a computer monitor that was less than high definition and then run the sound through my office stereo. Additionally, even though I have a very fast broadband Internet connection, the stream would pause sometimes. Also, there was markers in the stream to show where one song started and another ended. Not exactly the best audio-visual experience. The show also comes on two CDs. But since I don't review live CDs if there is a DVD available, I didn't bother with audio recording. (Why would anybody listen to an audio version of a visual concert experience if they have it? Doesn't make any sense to me.) Based on these things and my experience, it would be easy to have a negative opinion of The Theater Equation. Yet, despite the my below average A/V experience, the take away here is much different, the polar opposite. Everything about this theater performance of The Human Equation is impressive and engaging. The production is visually stunning from the stage to the lighting to the steam punk wardrobe for several of the players. The choir is large and encompassing, giving more depth to the vocal arrangement. Van den Broek also organized an impressive band that includes several string instruments to give the music a true orchestral feel. The only thing that was lacking, and I'm hoping it's included with the DVD/CDs, is a lyric booklet. It would be helpful to have to follow along with the story. 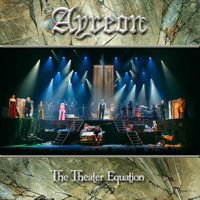 Nevertheless, the bottom line: if you liked Ayreon/Lucassen's The Human Equation and had any inkling of what it might be like if performed live, then this is quite the imaginative and creative production. The Theater Equation is definitely worth your interest. If you liked Ayreon/Arjen Lucassen's The Human Equation and had any inkling of what it might be like if performed live, then this is quite the imaginative and creative production. The Theater Equation is definitely worth your interest.